On Monday, film actress Hema Malini, Rajya Sabha MP Shri Veinkaiya Naidu, Tamil Nadu BJP President Shri P Radhakrishnan, central General Secretary of party Shri Jagatprakash nadda and Shri Dharmendra Pradhan, national prabhari of various cells Shri Mahendra Pande, BJP’s national spokesperson Shri Nirmala Seetharaman, central treasurer Shri Vani Tripathi, Kerala’s BJP President Shri V.Murlidharan, BJP’s central Secretary Shyam Jajoo, Human rights cell’s Shri Shobha Upadhyay, Jharakhand’s Chief Minister Shri Arjun Mundaji, leader of opposition in Lok Sabha Shri Sushma Swaraj and Gopinath Munde will visit Shri Narendra Modi in Sadbhavana fast on Monday. Raj Thackeray was there on stage in the morning. Hemu Gadhvi’s son on stage. Singer Devang Patel on stage. Vinod Khanna’s wife Kavita Khanna on stage. 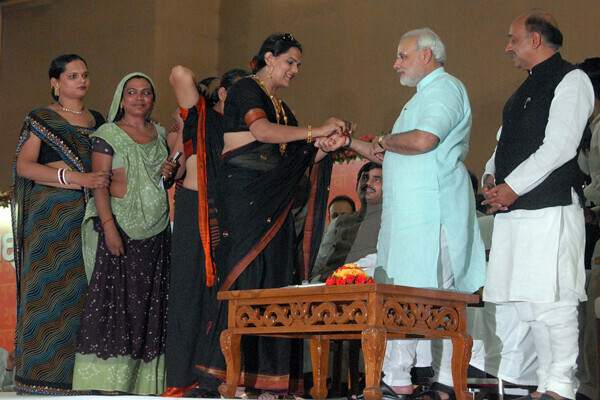 -Ahmedabad’s eunuchs greeted Namo on stage and tied Rakhi. -Famous poet Shri Tushar Shukla, Bollywood’s script writer Shri Niraj Vohra, Gujarati actor Makaranda Shukla visited Narendra Modi on stage. -Tribal from Dahod offered a big turban to Chief Minister Modi. -Veteran Gandhian Shri Ghelubhai Nayak(84) came to greet Narendra Modi from tribal Dang district of south Gujarat. -Famous Gujarati Sugam sangeet artists Shyamal, Saumil and Aarti Munshi greeted Shri Modi on stage. -Famous handicapped singer Shri Bankim Pathak also greeted Shri Modi. -Actress Roma Manek greeted Shri Modiji.